#1: Youth ministry is ALL ABOUT RELATIONSHIPS! Gateway Church says it so well, “We’re All About People”. Seven’s leadership mission statement is similar: To love and encourage young people.” My leaders don’t have to be Bible scholars. They just need to love people enough to encourage them, pray for them, give them time, and respect them. At the game, kids were having a blast and I immediately thought WE NEED TO HAVE MORE FUN AT SEVEN!!! WE NEED MORE FOOD!!! WE NEED A BETTER WAY TO LET PEOPLE EXPRESS THEIR NEED TO BE SOCIAL!!! How can you give the kids more time to talk and be heard during your youth night? A simple step may be cutting a song or shortening your sermon and add a discussion time or small groups to your service. #2: Youth ministry doesn’t have to be perfect. 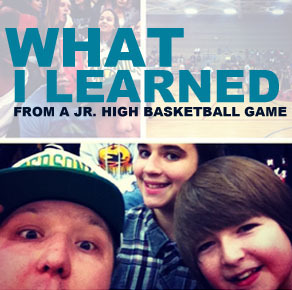 As you may know, Jr. High basketball isn’t exactly the NBA – the kids didn’t care. The cheerleading was sloppy – the kids didn’t care. It was hard to hear the music during the half time show – the kids didn’t care. There were adults and parents EVERYWHERE – THE KIDS DIDN’T CARE! I love that youth groups are so cool… and at Seven we strive hard for excellence. I believe God and this generation deserve our best. I also know the kids would rather talk and be heard then watch your human video. Don’t act like you didn’t rock a Carmen tune or two! #3: Youth ministry has to stop denying that kids have short attention spans. I know your a good preacher… I know you’re awesome! I know you’re the next Judah Smith. I BELIEVE YOU! I also know that kids are now used to tweeting, instagraming, facebooking, skyping, watching a TV show, and doing their homework all at the same time. It is NOT a good thing but kids need more mental stimulation and they need your youth service to MOVE. Halfway through the game the kids all around me were talking about going to the skate park after the game. They were already onto the next thing. You can get creative and figure out ways to work with that or you can deny it and become another boring expression of church. Figure out ways to keep the service and sermon fluid and interactive. Many of the kids feel ignored at home and need attention from authority. TAG, YOUR IT! I am not telling you to preach for fifteen minutes. I am saying you need to find the balance for that hour and half of spiritual, social, emotional, musical, and mental stimulation.